If you arrive at Düsseldorf International Airport, you can reach us by Taxi (a 40-minute ride), by local trains (RE or S-Bahn) or by car. Taxis are always available at the central arrival gates. The terminals are connected to the Airport Railway Station (‘Bahnhof Düsseldorf Flughafen’) by the SkyTrain, which travels between the terminal and the ‘Flughafen’ airport railway station at 3½ to 7 minute intervals from 3:45 a.m. until 0:45 a.m. daily. The journey between the two end stops, the ‘Bahnhof Düsseldorf Flughafen’ railway station and ‘Terminal C,’ is 6½ minutes. Should you not have a valid ticket, you are required to obtain a short-range fare ticket in order to ride on the SkyTrain (or on substitute buses). Ticket vending machines are located at the SkyTrain stations. The fare for getting to and from the airport is covered by the airfare ticket at some travel operators and airlines. For more detailed information, please contact your travel agent directly. Should you have to buy a ticket (about € 12.00) for public transport (VRR), you will find ticket vending machines in the SkyTrain terminal or the Airport Railway Station. For getting from Düsseldorf Airport to ICAMS you need a Zone D ticket. Please make sure that you have sufficient small change or bills, as these machines only accept EC-cards and cash, but no credit cards. Public transport (VRR) tickets also cover the Sky Train fare. At the airport railway station you have to take a local train ‘Regional express’, RE1, RE6 or S1 in the direction of either Dortmund, Hamm, or Minden. You can download the timetables of the S1 on our website. You can plan your individual connection in advance at vrr.de. Please note that the faster IC-type or ICE-type trains may not be used with tickets for local trains. However, you can buy tickets for these trains online at www.bahn.de. From ‘Bochum Hauptbahnhof’ you can either continue your journey by public transport, taking the subway line U35 (on weekdays the trains leave every 5-10 minutes) into thedirection ‘Hustadt’ and get off at ‘Ruhr-Universität’ after 9 minutes. Head right and walk across the pedestrian bridge towards the university. On the campus: Due to a construction site the engineering buildings can currently only be entered from the south; therefore walk straight towards the Central Library (‘Universitätsbibliothek’) and walk past the library on the left-hand side. Turn left directly in front of the Central Lecture Hall (‘HZO’) and walk straight towards the engineering buildings (there are some stairs). Walk past the ‘HIA’ and keep walking straight. Then, enter the ‘ICFW’ building (where the ICAMS is situated) via the lecture hall ‘HIB’. You enter the building on the floor 02. Should you prefer taking a taxi, you will find cars at both entrances, usually more of them at the main entrance. The fare to ICAMS is about € 13. 6. Once you have parked your car, exit the car park via the stairs leading to the campus. 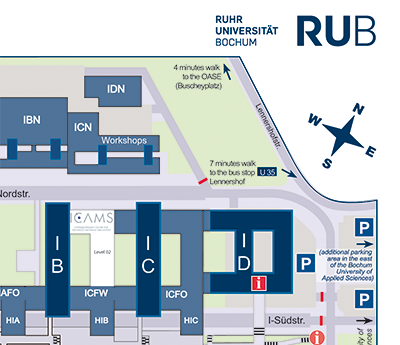 Alternatively, you can also park your car on the additional parking area of the Bochum University of Applied Sciences; therefore, follow the ‘Universitätstraße’ and take the turnoff ‘Ruhr-Universität-Ost’; follow ‘Schattbachstraße’ until you arrive at the parking area on the left side of the road; park your car and walk towards the engineering buildings; walk past the ‘ID’ and the ‘IC’ and enter the ‘ICFW’ via the lecture hall ‘HIB’. 2. At interchange Bochum/Witten take exit no. 19 “Bochum-Querenburg/Universität” and continue with 3. above. 1. At interchange Bochum take A 43 into direction Wuppertal and continue with 2. above. 2. Turn left into direction „Zentrum/Universität“ and continue with 3. above. 5. Turn left into direction “„Zentrum/Universität“ and continue with 3. above. 6. Turn right into Universitätsstraße and follow it for approx. 3 km. 7. Take the turnoff named ‘Ruhr-Universität-Mitte’ and exit the ‘Universitätsstraße’ and continue with 5 above.